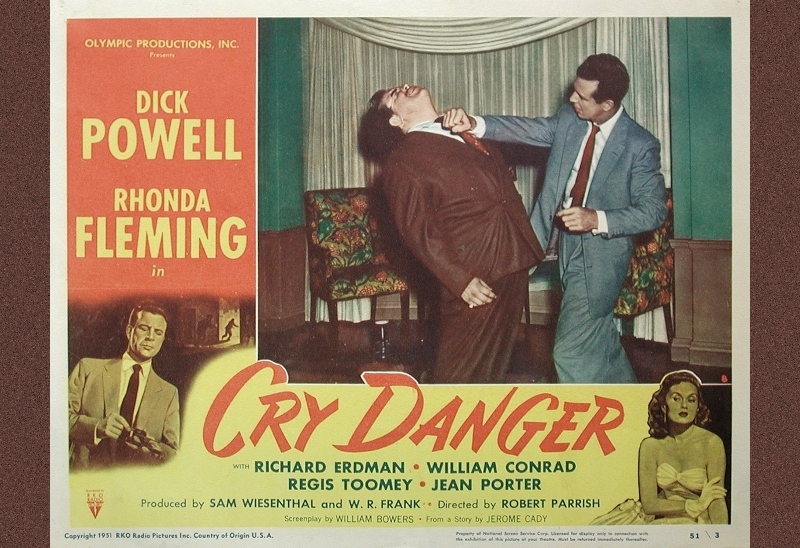 Editor-turned-director Robert Parrish's debut film Cry Danger (1951) is a taut, entertaining late-career starring vehicle for Richard Powell. As the wrongfully imprisoned, recently freed Rocky Mulloy, Powell's character attempts to find the real criminals behind the robbery that stole five years of his life...and, of course, the $100,000 he allegedly took in the first place. 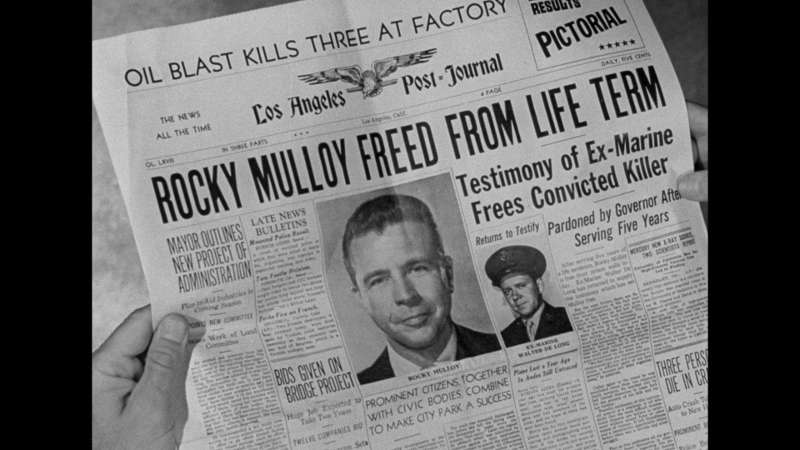 Mulloy's also looking to clear the name of Danny Morgan, currently imprisoned for the same crimes; Morgan's wife Nancy (Rhonda Fleming), on the other hand, seems more interested in pursuing Mulloy than reuniting with her husband. Meanwhile, ex-Marine Delong (Richard Erdman), whose testimony freed Mulloy, helps our hero dig up plenty of dirt while cozying up to Darlene (Jean Porter), a pretty pickpocket who happens to live near their temporary hideout. It may sound a little convoluted, of course, but Cry Danger never feels bloated, gimmicky or hard to follow, and this is coming from someone with very little foreknowledge of classic film noir. Characters and their relationships are introduced smartly, exposition is provided without feeling too obvious and, more often than not, the twists and turns come at exactly the right time to keep first-time viewers right on their toes. Performances are uniformly excellent, dialogue is (not surprisingly) brief and to the point, while the no-nonsense editing by Oscar nominee Bernard W. Burton keeps things moving along quite nicely during the film's brisk 79 minute lifespan. Upon learning that Cry Danger was shot in just over three weeks, the film's compact and efficient atmosphere feels all the more natural. Yet it's a sizable amount of wisecracking humor (bolstered by the efforts of dialogue director Rod Amateau, not to mention the story/screenplay by Jerome Cady and William Bowers, respectively) that shapes Cry Danger's most lasting, memorable moments. Having never received a domestic release on DVD (or VHS, as far as I know), Olive Films' dual Blu-ray and DVD releases should be well-received by genre enthusiasts. Recently restored by the UCLA Film & Television Archive (funded by the Film Noir Foundation), Cry Danger looks and sounds quite impressive on home video; in all probability, even better than its 1951 theatrical release prints. Licensed from Paramount, Olive's single-layered disc sadly includes no bonus features or even optional subtitles/captions...but the film's the main thing, and this is most certainly not one to pass up. Presented in its original 1.33:1 aspect ratio, this 1080p transfer of Cry Danger (restored by the UCLA Film & Television Archive) looks quite impressive after a rough start during the opening moments. Black levels, shadow detail and textures are very strong, though several of the nighttime sequences (including the opening) suffer from a moderate amount of dirt and debris. A healthy layer of film grain is also present, while no major digital imperfections---including excessive DNR, contrast boosting and/or edge enhancement---could be spotted along the way. It's not quite a flawless transfer from start to finish...but it's certainly better than expected, so die-hard film noir fans will undoubtedly be thrilled. NOTE: This review's still images were taken from promotional outlets and do not represent Blu-Ray's native 1080p resolution. The audio comes through cleanly in DTS-HD 1.0 Master Audio, preserving the film's original mono mix and faithfully reproducing the dialogue and music cues. There's little depth and this is undoubtedly a "thin" presentation from start to finish, but considering the film's age and budget it's completely understandable. In other words, lifelong fans and newcomers alike won't find much to complain about with this lossless audio mix. For me, the only glaring problem here was a lack of optional English subtitles and/or Closed Captions, although that's pretty standard for Olive releases. Not surprisingly, the plain-wrap menu interface includes just two options: "Play Movie" and "Chapter Selection". Loading time is fast with no trailers or advertisements beforehand, aside from the Olive Films logo. This one-disc package arrives with a promotional insert and attractive vintage cover artwork. Unfortunately, no bonus features have been included. 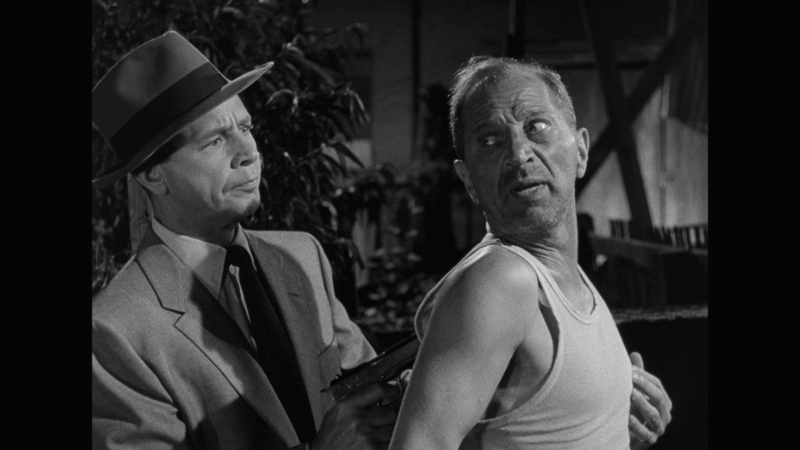 You don't have to be a rabid disciple of film noir to enjoy Cry Danger, but it helps a little. Still, this is an entertaining, well-acted and accessible little production that's aged quite well during that last 60+ years, thanks in part to its low profile and a terrific A/V presentation on Olive Films' new Blu-ray, licensed from Paramount. The lack of bonus features (and, to a lesser extent, subtitles or captions) is surely a handicap, at least enough to discourage plenty of blind buys. Firmly Recommended for those with more than a passing interest in the genre, but slightly less so for newcomers.